Extract from review…’The first release that peaked my interest was The Island from Bioni Samp who delivers an engrossing mix of sparse repetitive techno and atmospheric electronica. Weighing in with six tracks it actually resembles a small album rather than a standard techno EP and I believe this is the reason Aconito releases really stand out. Even the four trackers have an ‘albumy’ ring to them, with the producers delivering much more than the standard two tracks and two remixes. While there is plenty of good quality techno here ready for the dancefloor and having a mix the EP’s work just as well for stand alone listening from start to finish, each producer taking you on their own unique mini-musical journey. Personally I think this is praise of the highest order because there are very few EPs out there which i listen to in full on a regular basis.’…. 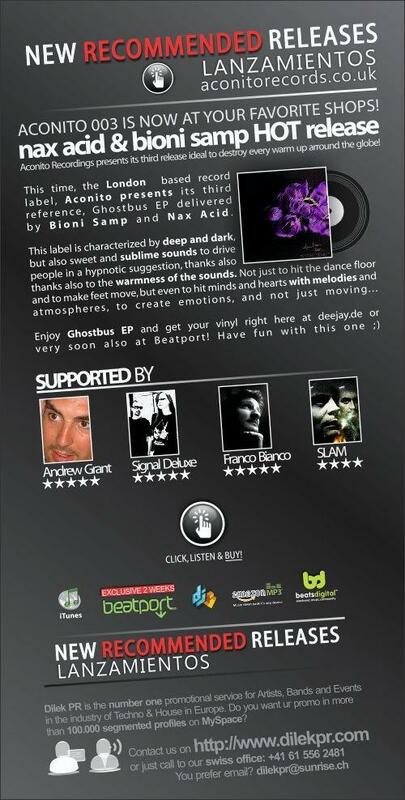 read rest of Aconito Records Label review here. Yay next ‘Beespace or Hive Synthesis’ live / installation at Piksel Festival next week.